This 10” plush teddy bear is a great new baby gift and makes a cute birthday or older sibling present as well! So cute and cuddly, it is certain to be one of their most cherished toys to hug for years to come. 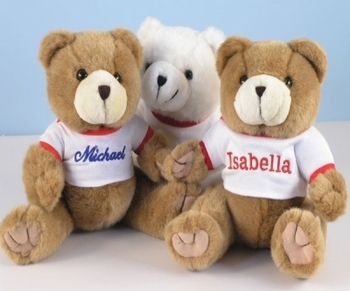 The bears come personalized with child’s name and date of birth embroidered on the front of the shirt to let everyone know their special day. You choose either white or brown bear as well as script or block styled lettering font. Each comes luxuriously wrapped and is a wonderful childhood keepsake!